June… what a wonderful month! There are lots of reasons why I enjoy the month of June. First and foremost, June is my birth month! This year I’ll be turning 25 – in just a few days, actually. June 6th is my birthday! June is also the sixth month of the year, meaning that we’re nearly halfway through 2018. That makes June a perfect time to reevaluate your new year’s resolutions, reaffirm your year’s mantra, and perhaps even create a fresh Level 10 Life. 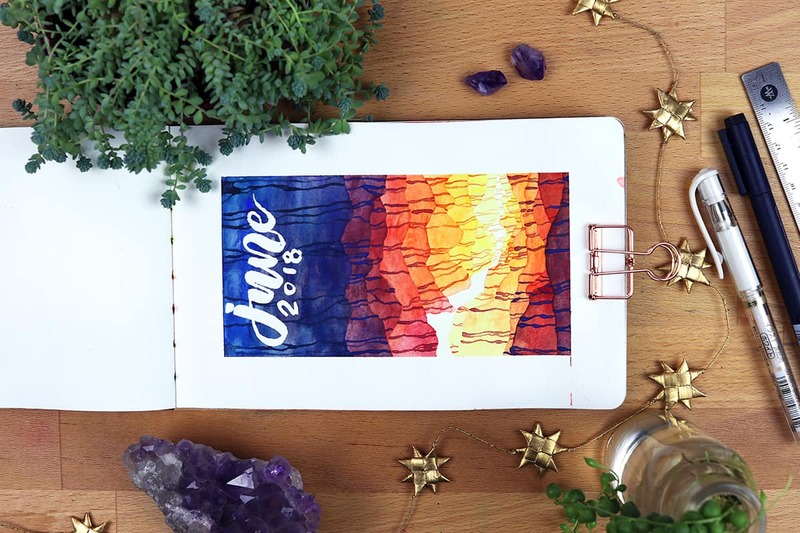 But for now, let me show you my June monthly setup in my watercolor planner! This month’s final product is a bit different than what I normally do, but it was so fun to create and it looks stellar. Keep scrolling to see the setup and check out the materials I used! Are you subscribed to my Youtube channel? Click here to subscribe and catch all my latest videos as they come out! 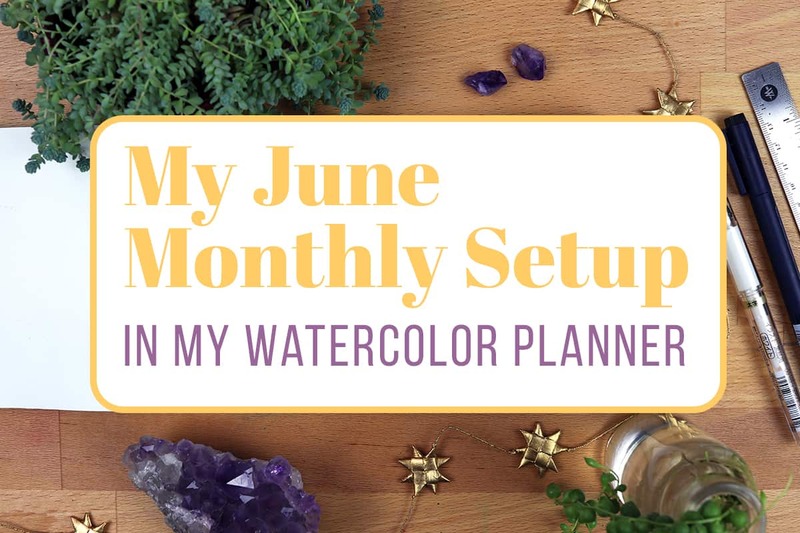 The process of creating my June monthly setup was incredibly interesting from beginning to end! I got the sudden desire to paint canyons. Well, that’s not totally true. I’ve wanted to paint canyons for a long time, but landscapes intimidate the hell out of me. Since they’ve always been so scary, I’ve never really tried! So the idea didn’t come out of nowhere, but the courage to make an attempt did hit me out of the blue. I leaned into it and gave it a shot, and boy oh boy was that the right call. These canyons turned out stunning! I’m especially in love with the color range and vibrancy. For the cover page, I wanted to paint the canyons as if you were right in the middle, looking down the path until it fell out of view. 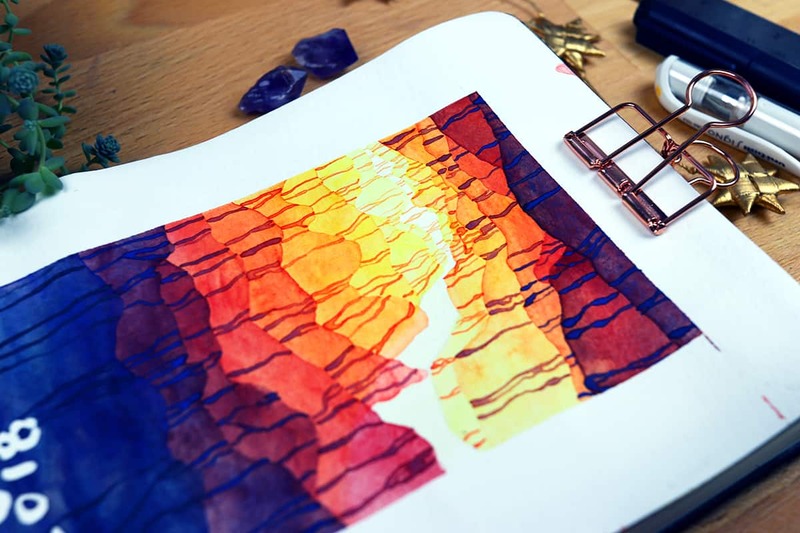 I drew inspiration from slot canyons, though I’ve never visited any myself. The calendar page, though, is a different perspective. I tried to capture the view as if you were standing in the canyons and looking up. I’m not sure if it quite comes across the way I intended, but it looks heckin’ cool anyway. My June monthly setup is largely the same as it’s been for ages. There are no big changes to my calendar, memories section, or habit tracker. Though I have been considering expanding my habit tracker to fit in more habits, that will have to wait for another month. Whether you are enjoying the early summer of June or the beginnings of winter, take this time to check in with yourself and your life. Ask whether you like the direction these last six months have taken, and see if there’s anything you want to change. June is a great time to ground yourself and reignite your goals, so don’t let this opportunity pass by! Even a quick List of 100 will help you center yourself. I hope June is kind to you and you enjoy these gorgeous days before they’re gone. Have a happy June! Beautiful layout! I’m not an artist (yet) but I want to learn more about your technique. Did you use the same pen for the word “June” as you referred to above? I noticed you painted over it and it repelled the paint nicely. Happy Birthday! June colors are beautiful! Thanks for sharing! The colors turned out even more gorgeous than I imagined! Thanks so much Dianne. Happy 25th Birthday, hope you have a super great day. Your artwork is absolutely beautiful! 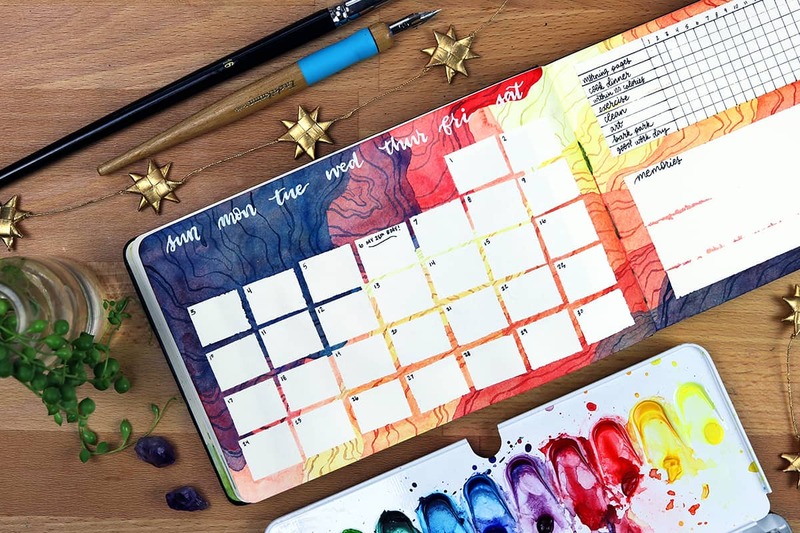 I love the colors and design of your June calendar; you are so creative! 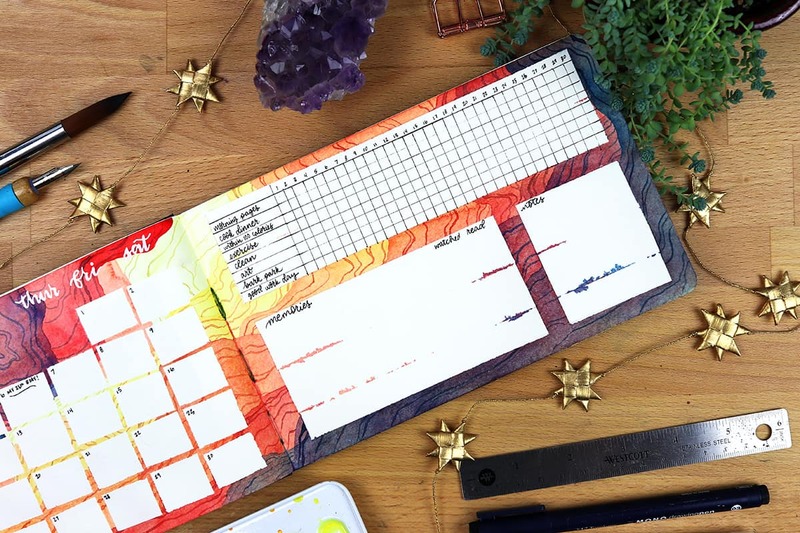 I have a question: what type of pen/ink do you use for the white lettering you did on the calendar page? It’s so pretty with the watercolor background! Thank you for sharing your creations; you are an inspiration! Thank you so very much Nancy. I lettered the days with a Uniball Signo White Gel Pen! If you go to the video on YouTube and expand the description, all the supplies that I use are there along with a link so you can find them easily. Beautiful as always! Check out the list of events in Portland this summer. Most of the events in the city are along transit lines (always recommended). https://www.events12.com/portland/ pick the month on the upper left under Portlandia’s picture to see what’s happening when you make it here! Oh what a great tip! Thanks for that Cheryl.